Create your own Greetings Cards. The fast, fun and easy way to create your own greeting cards! Packed with thousands of high quality images, colourful photographs and funky fonts to spice up your projects, making your own personalised cards has never been so much fun! So easy to use! Achieve marvellous results in minutes! Select a ready-to-use template, or design your own greeting cards from scratch using graphics and photographs from the huge library supplied on the DVD-ROM. All popular graphic file formats are supported, making it easy to import photos and images form your digital camera or scanner. Print your finished card on your inkjet printer. There’s even an option to send your design to friends and family electronically via email. PACKED WITH CREATIVE TOOLS FOR PROFESSIONAL RESULTS! Clip Art 175,000 Explore a vast collection of premier quality clip art by category, or search by keyword. Simply drag and drop your chosen image straight onto your greeting card – it couldn’t be easier! Give Your Message More Impact! Whether you’re creating an artistic, heartfelt or humorous card, this comprehensive collection of fonts will provide you with more than enough ideas to being your text to life. Send electronic greetings via email!! Use the CardViewer feature to create “virtual cards” that are ready to email. Your family and friends can view your fantastic creations, even if they don’t yet own Create your own Greeting Cards Deluxe. You can even add your own music! Design the perfect card for any occasion! Christmas, New Year, Easter, St. Patrick’s Day, Birthday, Halloween, Anniversary, Wedding, Engagement, New Baby, New Home, New Job, Invitation, Graduation, Good Luck, Passed Your Driving Test, Passed Your Exams, Congratulations, Sympathy, Get Well, Valentine’s, Thank You, Christening, Retirement, Bon Voyage, Miss You, Thinking of You, Mother’s Day, Father’s Day, First Day of School, Best Teacher …and much more! Includes 100+ commercial quality sentiments created by Arty & Crafty Supplies Add the personal touch! Express your innermost feelings with over 100 professionally created greeting card verses, or simply type your own messages. WHAT YOU CAN AND CANNOT DO WITH CREATE YOUR OWN GREETING CARDS, 225,000 IMAGES and 30,000 PHOTOS. You may incorporate any image(s) into your own original work and publish, display and distribute your work in any media. You may not, resell, sublicense, or otherwise make available the image(s) for use or distribution separately or detached from a product or Web page. For example, the image(s) may be used as part of a Web page design, but may not be made available for downloading separately or in a format designed or intended for permanent storage or re-use by others. * Calculated by multiplying the different combinations of images, photographs and fonts. Create your own 3D Greeting Cards…and much more! 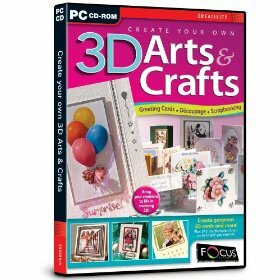 Now you can use your PC to design beautiful three-dimensional gift ideas with that personal touch! 3D Découpage is a popular craft where identical prints of the same picture are individually cut out, shaped and layered one on top of each other, to form a delightful three-dimensional picture. This easy-to-use software gives you total freedom to create your own greeting cards, stunning 3D photographs, framed portraits, scrapbooks, calendars and a whole host of gift ideas. Backing Paper and Tile Builder - quickly and easily create beautiful backing papers and borders directly from your own original image or photo. Pyramage Card Maker – create stunning multi-layered cards where the image builds up to a pyramid point. Shapes include diamond, triangle, oval and circle. Special Effects – including whirl, wave, emboss, blur, rotate and seamless for your tiles and backing sheeting. 1. CHOOSE – Select a background image. All popular PC image formats are supported (e.g. JPG, TIF, BMP, etc). 2. CUT OUT – Use the on-screen tools to choose the elements that will stand out as 3D. 3. PRINT – Prepare your elements for print. Save paper by arranging all the elements on one page. 4. CREATE - Create multiple 3D layers by using the provided sticky foam pads as spacers. Includes 242 sticky foam pads!